Reinhard Marx, a Catholic bishop who has criticized Germany for not helping the poor, is to be appointed archbishop of Munich, the old diocese of Pope Benedict XVI, Catholic sources said Wednesday. Marx, 54, is currently Bishop of Trier, a western city that happens to also be the birthplace of his namesake, Karl Marx, the founder of communism. The archdiocese of Munich is one of Germany's most powerful Catholic divisions. Cardinal Joseph Ratzinger, now pope, headed it until 1982, when he moved to Rome and was replaced by the incumbent, Friedrich Wetter, 79. The sources confirmed the accuracy of a report in the newspaper Tagespost of Wuerzburg that the Marx appointment would be made public within a few days. Marx's office and the Munich archdiocese declined comment. A moderate conservative doctrinally, Marx has been outspoken on social issues, demanding that German leaders act against poverty, create jobs and accept refugees. 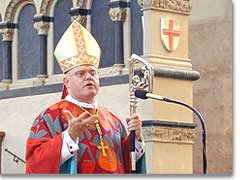 The church announced Wednesday the appointment of Franz-Peter Tebartz-van Elst, 48, as bishop of Limburg, Germany.